My new knit market bag is finally finished. This is the fourth time that I’ve used this pattern but the first time, I knit these handles and added buttons to the base of the handle. 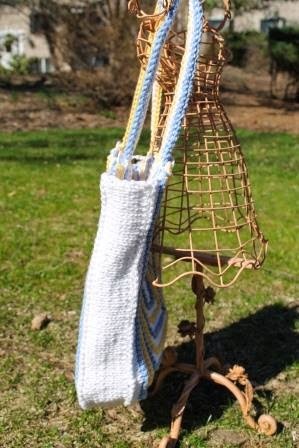 The original pattern is called Himalaya Tote and appeared in the Fall 2001 issue of Interweave Knits. I made the first one in 2002 following the directions as written and using a beautiful combination of blue yarns. I added leather handles and lined that one and still use it today when I go to Festivals and when I travel. It’s big and roomy. After that, I started experimenting with the pattern. 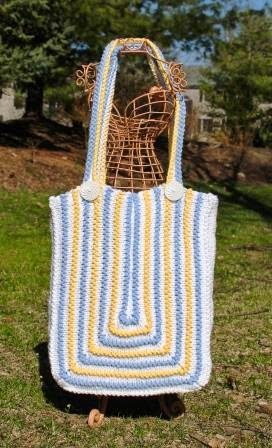 I love the design but wanted a bag that was a little sturdier and could be used as an every day grocery bag. For this version, I used 2 strands of Lily Sugar and Cream Worsted Weight cotton yarn held together and a circular U.S. Size 10 1/2 circular knitting needles. I cast on 43 stitches for each side and 34 stitches for the bottom, a total of 120 stitches. I used white as the main color and knit row 1 and row 4 in contrasting color, first the blue then the yellow. I knit the depth of the bag at 3 1/2 inches. It took me a long time to decide on handles. I finally decided to mimic the color combination in the bag and using a U.S. Size 9 needle, I cast on 88 stitches with 2 strands of yarn held together using the contrasting color, I knit one row in that color, changed to the main color, and then used the other contrasting color to knit one row and cast off. The finishing touch is the buttons. I was thrilled to remember that I had bought these white buttons when a local Yarn store was closing and I had them stashed in my button jar. I think they finish the bag nicely. They also hide the seam where I joined the handles to the bag. I’m thrilled that this is finally done. I started knitting it well over two years ago and for some reason, I just kept putting it back in the bottom of the WIP pile. I discovered it while doing some early Spring yarn cleaning and finished it in an afternoon. Hope I can finish a few more of the WIP in the pile by the end of the Summer.